The third installment of the ongoing jet engine build, where we have ignition, and Luke finally confronts his jerk dad. Now that robot season has finally slowed down, I have a little more time to give the turbine some much needed attention. It now has something that resembles an electrical system. It is still pretty crude but there is enough to see if this puppy will make fire! I have been having difficulties getting the engine to light. From rusted fuel pumps to sticky valves, I have been having a heck of a time getting all the cobwebs out of this beast. Initially I tried to run the engine off kerosene and two small aircraft batteries. The batteries didn't have the juice and I made a nice kerosene puddle out back. To make things easier on myself I'm tried to start the engine off propane. It's only slightly sketchy (thats how I explained it to our new facilities manager). I also got some huge batteries to quench its insatiable thrist for current. Here is a quick video of our startup attempt and a quick tour of the engine (spoiler, it went well). We got the engine to self sustain a burn but my propane rig just isn't big enough to bing it up to full power. Next step: Get it running on kerosene. Then, likely get a noise complaint ticket soon after. Read down the page, Casey already explained the reversed fuel pump. Casey, great to see your project moving forwards! In the video at 3:00 you talk about a fuel pump. Is it "wired backwards"? The casting says OUT and IN, wouldn't the IN be facing the Oil Filter and the OUT facing the dump valve? This would make a nice upgrade to my wheelchair - after all whats the worst that could happen i wind up in a wheelchair. I'm guessing it's a Star Wars reference. Very subtle. I completely missed it. Very cool project! Not much cooler than a turbine engine! My first one was a Boeing 502-6 turboshaft that I got up and running. I had my own fuel system & oil system issues, but that engine is very straight forward and easy to diagnose. My largest turbine was a Lycoming T53-L-1B, an early model engine used on Huey's. Good for 860shp. I've had a couple others as well, plus a turbocharger based engine I built. Good times. Best of luck to you on your future turbine endeavors! Some model turbines do start on propane/butane and then switch to Jet A, but I think that has more to do with them igniting the fuel with a glow plug whereas you have a really hot spark. I think if you get the mixture right it'll light right off. I would stick with running it on jet fuel, simpler than trying to switch from propane and a typical BBQ propane regulator will never feed it enough gas to actually spool up. With a single igniter plug kerosene is hard to start. Mix in some gasoline. I'd get rid of the propane, you're going to break it. Gasoline also makes it smoke less. Back in the old days we ran JP-4 which had gasoline in it, and now they run JP-8 to make engines last longer, but they smoke more. Maybe start with two parts kerosene to one part gasoline and see how it goes. P.S. You should never see a flame out the back "after" startup. If you see a flame the engine is destroying itself. The EGT should rapidly rise on start (almost enough to scare you) and then quickly come back down to normal operating temperature (just guessing, about 600 - 700 degrees F) after the pooled fuel is consumed. The ignitor should be running before fuel is turned on. Listen to any turbo prop start up and you'll hear the ignitiors snapping as soon as the starter kicks on. Fuel is not turned on until the engine is at the right speed and then ignites almost immediately under normal circumstances. Hmm, any relation to Conner Kuhns? That aside, look forward to seeing the build progress! I too have been building a jet engine. (Not nearly as big or as powerful as yours) A team of friends and I built one for my school's science fair. We even used sparkfun relays to start it. They mention the jet engine at the bottom of this article written about the science fair. When I was in school they were tearing down a dormitory. There was a huge pile of batteries (~2tons worth) from the battery backup system. I asked if I could have one, the foreman said "Take em all, it's costing me money to get rid of them" So they (all 2 tons) now part of an off the grid cabin in western Colorado. That sounds like a cool project! super cool project! Have you looked at the fuel injectors spraying? Do they have atomizing tips or just spray a stream? Any idea of what fuel consumption is? I have run the injectors outside the engine. they are spraying as specified in the manual. Everything looks good I just don't know if I'm getting proper fuel delivery now. I may need a roughing pump to get through the filter. It's unlikely that I would be the first to suggest that the motorcycle in the background and the jet engine get married. If not the motorcycle, then maybe the vacuum? 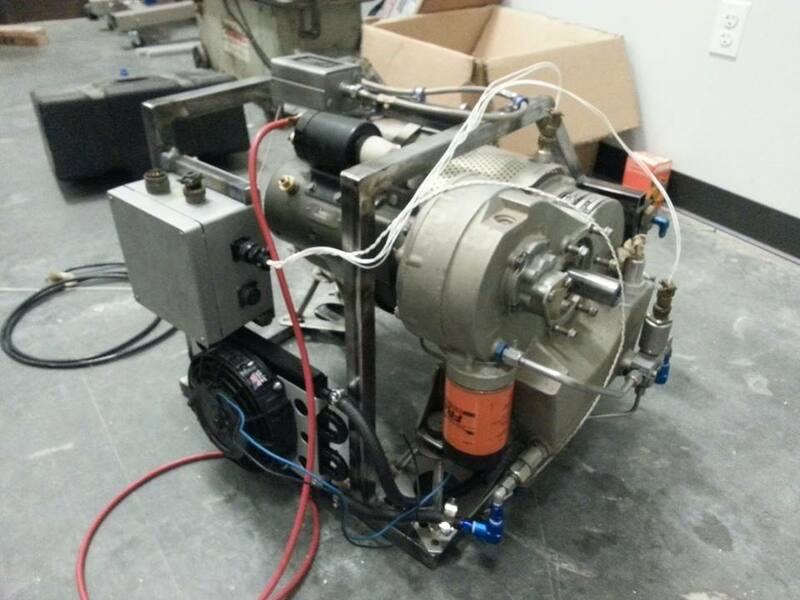 Also some dude just posted a how to build a jet engine instructable. Not as advanced as this one, but apparently noisy. July must be a good month to build a jet. That may be a stupid question but why are the fuel pump markings IN and OUT the reverse of what you mention in the video? And are you using a MAX9924 for your VR sensor? So during the pump rebuild, I put it together 180degrees out of phase. I just need to pop it back apart and rotate it. Ahh.. And I thought I was the only one who noticed.. :-) So much for the "easy" fix.. 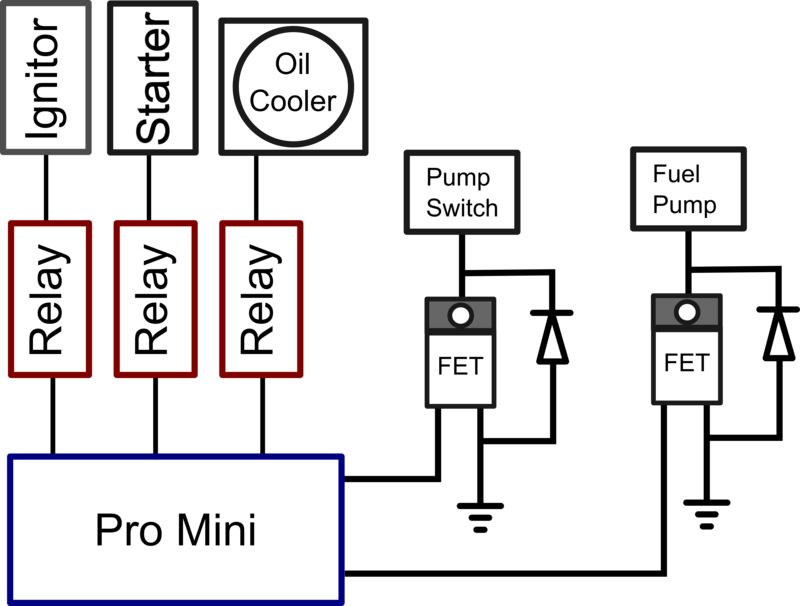 So, Seeing as you're bypassing that whole fuel system for the time being, was there another fuel pump back there that we didn't see, or did you really not expect it to have a chance at starting as it sits?